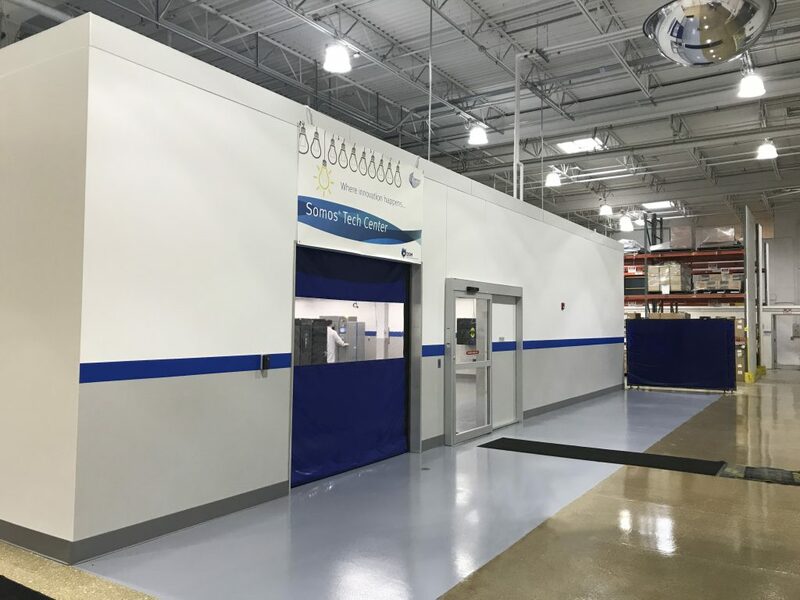 Lamp Incorporated has completed construction at DSM’s Elgin, IL location a 3,500 SF temperature and humidity-controlled room inside an existing warehouse for their Somos® Additive Manufacturing Materials product line. It is constructed of structural steel and heavy gauge studs, and acts as a mezzanine on top to hold mechanical units that are needed just for that room. The room will hold multiple 3D printing machines. The ceiling grid, tile, automatic doors, and overhead doors are all clean room products, similar to hospitals. New LED light fixtures that are less than 2” thick. Three ceiling hung “bus bars” that have the capability to change voltage with the flip of a switch.